Korea was a whole different world in the early 1980s when Ambassador Christopher Hill was last posted here. Returning to the "land of the morning calm" this week nearly two decades later, Hill, Washington's new top envoy to Seoul, faces a string of issues completely different to what existed when he was here previously. The 52-year-old career diplomat and Korea expert, who succeeds Ambassador Thomas Hubbard, served as secretary for economic affairs at the U.S. Embassy in Seoul from 1983 to 1985. Vowing to boost bilateral ties between Seoul and Washington, Hill promised on arrival at Incheon International Airport Thursday to do his best to maintain and promote the special relations between the two countries. "The United States and Korea have had, I think, a very special relationship over 50 years and I look forward to doing my part to see if I can build on that very special relationship," he said. "I also know that even though I was here for three years in the 1980s, one has to be a little careful about drawing on too much experience from so long ago. So, even though I'll certainly draw on my experience from the 1980s, I think I also need to do an awful lot of listening to people to understand what has been going on lately." He is set to meet South Korea's Foreign Minister Ban Ki-moon next week and pay a visit to President Roh Moo-hyun early next month. Hill returns at a crucial time for Seoul and Washington as the two allies face strained bilateral ties and readjustments to their half-century alliance while working jointly to resolve the North Korean nuclear standoff. He has a series of important tasks ahead, such as trying to help resolve the North's nuclear arms issue and reshaping the U.S.-Korea alliance amid the increasing anti-American sentiment in this country. In recognition of his key post, he is the Herald Person of the Week. In an interview with Korean reporters in Washington last month, Hill expressed his affection for Korea, saying he volunteered to return because while in Seoul in the 1980s he developed a liking for the people and culture, including the food and architecture. Among the first items on his list of things to do are to travel to local regions and visit Buddhist temples and historical sites. He likes to exercise and play tennis, and he plans to learn how to play golf. Hill, who joined the State Department in 1977, comes here after serving four years as ambassador to Poland. He was previously ambassador to Macedonia and a special envoy during the Kosovo crisis. He also served as the senior country officer for Polish affairs in the State Department. Other overseas assignments besides Korea, Poland and Macedonia have included Yugoslavia and Albania. In addition, Hill was a senior director for European affairs at the National Security Council. He is fluent in Polish, Serbo-Croatian, and also speaks some Macedonian and limited Albanian. 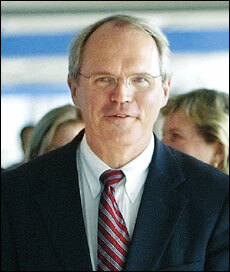 Prior to joining the State Department, he served in the Peace Corps as a volunteer in Cameroon. He graduated from Bowdoin College in Brunswick, Maine, with a B.A. in economics in l974 and received a master's degree from the Naval War College in l994. Joining him in Seoul are his wife Patty, their oldest daughter Amelia and younger daughter Clara, who was born in Seoul in 1987. Hill hails from Little Compton, Rhode Island. He is the recipient of several State Department awards, including the Robert S. Frasure Award for Peace Negotiations and the Department's Distinguished Service Award for his work in the Bosnian peace negotiations.